Delicious heart shaped marshmallows. Pink and White hearts. Perfect for Valentine's Day. No artificial colours or flavourings. 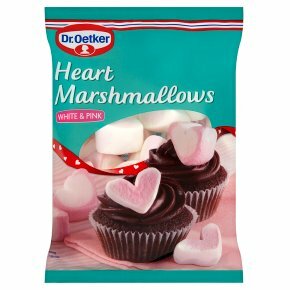 Ideal for Valentine's Day bakes, or kids baking, the Dr. Oetker Heart Shaped Marshmallows are delicious pink and white marshmallows perfect for decorating. These heart shaped marshmallows are great for adding a personal touch to baking. Can also be baked into your favourite recipes such as Rocky Road and Crispy Cakes. For use as an attractive decoration, place on icing just before it sets and on ice cream and desserts just before serving.